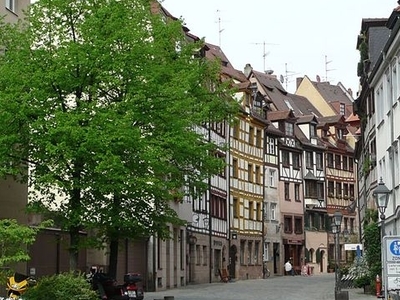 The Weißgerbergasse is a street in Nuremberg .It is one of the few predominantly preserved historical building ensemble of the Nuremberg Old Town .The Weißgerbergasse is located in Nuremberg District 0-06 in the north of the Pegnitz nearby Sebald old town. It runs from the lying to the south in Pegnitz near Maxplatz first northeast, then east direction Sebalduskirche for wine market. North run parallel to Weißgerbergasse the Geiersberg and Irrerstraße. The Irrerstraße begins at the wine market. The southern side of the corner building Irrerstraße 1 is located on the Weißgerbergasse. Erich Mulzer wrote about the ensemble Weißgerbergasse and its attractions: "At 22, the old houses Weißgerbergasse is the best preserved street in the old town today. In contrast to the fill rule here before but narrower and mostly built of half-timbered houses. It arises because, in spite of about the same height as road width and houses in the filling, a much more moving and more colorful image - characteristic of the Craftsman alleys of the old city, which always took place also varied active life. Works of art have receded back in Overall impression: So there is only one old Chörlein (at No. 25. ), And the Dormer remain mostly unadorned. Typical of Craftsman houses are instead the White Gerber Emblem of 1708, and the locksmith characters from about 1820 (both at no. 24) and the small Biedermeier door with carved fruit cornucopias (No. 28). The Eckfigur of St. Egidius with the doe (no. 26) is a copy of a destroyed like half-timbered house elsewhere.Some charming and picturesque courtyards (No. 19, 21, 23 and 35) are not generally available. This is also true of an impressive baroque garden room with rich stucco (in the passage behind the driveway next to no. 27). " A Nuremberg Mansion normally including front house, narrow wings, the courtyard and the rear building . The courtyard with fountains , stair tower, elevator bay and sometimes a little garden was often the center of daily life. At least the wing was on all floors open galleries (called "courses") as a combination of front and rear building. Often these galleries were moving but also on two or three sides or all sides of the courtyard. The jewelry architecture of the galleries was a Nuremberg mixing style of a Gothic tracery in the spandrels and later Renaissance columns and Baroque consoles . The Renaissance rather appropriate form with baluster - ('docking' -) parapets found in wood in the Weißgerbergasse 23 Timeless simple boards parapets has the Weißgerbergasse 35th. Visits many farms are now and again on the occasion organized by the Old Town Old Town Walks and friends at Heritage Day possible. The old town friends also organize tours of their own homes, even during the archaeological research. 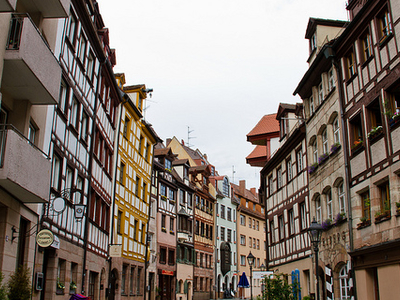 Here's the our members favorite photos of "Famous Streets in Nuremberg". Upload your photo of Weißgerbergasse!